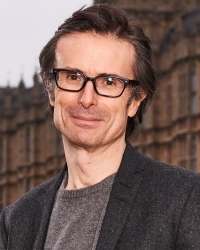 Rupert Lancaster at Hodder has signed a new book from political commentator Robert Peston. Hodder has world rights including serial and audio from Jonny Geller at Curtis Brown, and will publish this autumn. WTF: What the F--- Happened and What Happens Next? will explore the momentous developments of the past year. Peston said: "There has never been a more uncertain and unpredictable time for all of us. Those of us in the now hated liberal metropolitan elite got so much wrong in the past few years that I wanted to write a book that tries to explain what happened and what happens next - the questions we are all asking." Lancaster added: "The commercial and critical success of Robert Peston’s two previous books, Who Runs Britain? and How Do We Fix This Mess? - not to mention his 800,000 Twitter followers and 1 million plus TV viewers - show there's a real hunger for Robert's blend of in-depth research, enthralling narrative and incisive analysis." Peston is political editor of ITV News. He was business editor and economics editor at the BBC from 2006 to 2016, and has held senior positions at newspapers including the Financial Times and the Sunday Telegraph. He is also the founder of Speakers for Schools.